Soup offers a great way to warm up a cold night or help you recover from a cold or the flu. It is also a great low-carbohydrate meal or appetizer for a person with diabetes. Soup is filling and can contain lots of vitamins and minerals. The soup recipes listed below count as only one or no carbohydrate exchanges. They can also help you get more vegetables and protein into your diet. Try having some soup before a meal and you may find yourself eating less of the main meal. Or have the soup as your main meal for low-carbs and lots of nutrition. Add some of your own ingredients to give these soups your own special flair. But remember, adding carbohydrates such as pasta, rice, or other grains will add carbohydrate exchanges to the soup. This is fine if the soup is your main meal. If you are watching your salt intake, use more herbs and spices and go easy on the salt. Spread pumpkin seeds on a cookie sheet and drizzle 3/4 tsp canola oil on the seeds. Toast for five minutes, then remove from the oven. Heat the remaining oil in a stockpot. Add the onion and sauté for five minutes. Add the pumpkin and stock and bring to a boil. Simmer for 20 minutes. Add the milk, sherry, and cinnamon. Simmer for five minutes. 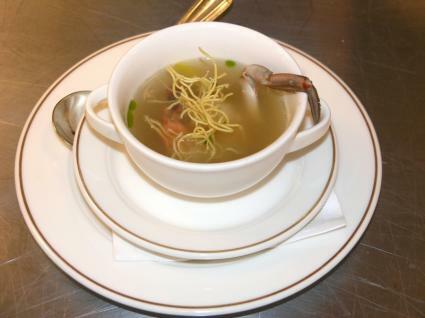 To serve, place soup in bowls and top with pumpkin seeds. Grind pepper over each serving. Adapted from: American Diabetes Association's "Diabetic Meals in 30 Minutes - Or Less"
In a large pot, heat olive oil over medium heat. Add the shallots and ginger. Cook until the shallots become translucent. Add the diced carrots and enough chicken stock to cover them. Bring the liquid to a boil, then reduce the heat to a simmer. Skim off any scum or fat which floats to the surface, cover the pot tightly, and cook for 15-20 minutes, or until the carrots are very soft. 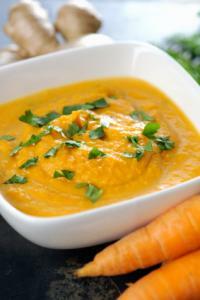 Place the carrots and chicken stock into a blender or food processor and puree until smooth. Serve immediately and garnish with a dollop of heavy cream and fresh chives. Adapted from: "Cooking with the Diabetic Chef "
In a large pot, combine water, broth, tomatoes, celery, onion, potato, bay leaf, salt, thyme, and caraway seeds. Simmer for 30 minutes to 1 hour. Add the cabbage, chicken, lemon juice, and sugar. Adapted from: "The New Soul Food Cookbook for People with Diabetes"
Whether you are diabetic or not, soup is a food that can fill the tummy without expanding the waistline. Add soup to your meal plan for a hearty, tasty change of pace.